← An intimate and a distant encounter. To coincide with the Bird/land exhibition, I’ve been invited to give the annual Halstatt lecture at MOMA as part of the Machynlleth Festival. Rather than just running through a series of images from the exhibition this talk will have quite a strong personal content. The fee is reasonably generous so I have the time and opportunity to look back over my career as a photographer. I often wonder how the most minute details of people’s lives can be recalled by those engaged in writing their autobiographies. How can conversations be remembered if they took place decades ago? Perhaps authors keep a diary on the offchance that it might be needed or maybe there’s a liberal dash of artistic licence involved? But photographs can certainly help and I’ve been delving back into my slide collection and memory banks to see what I can find. My first encounter with a camera came when my father gave me one of his old ones. I was about 14 and rushed around Britain taking pictures of the last steam trains in the couple of years before they were pensioned off. I even did a little developing and printing in the school darkroom until it was demolished. But I’m going to skip the very early years and move on to the late 1970’s after I moved to rural Wales. I was developing a keen interest in both wildlife and photography and North Ceredigion was a wonderful place to find myself. I was looking for a career in wildlife conservation and despite knowing very little about birds got a species protection job with the RSPB in 1979. I was sent to a remote part of north Wales where I was expected to watch two separate peregrine eyries about three miles apart which were annually robbed by falconers. I had hoped to be able to watch peregrines at close quarters but in fact spent most of the time cruising around the local roads looking for suspicious visitors. Police training would have been handy! It was not really a success. I have two lasting memories of my couple of months there. Firstly managing to mentally construct a human figure on a ledge close to the eyrie half way up a cliff-face when in fact it was a jumble of rocks. I don’t think the local bobby was amused when he arrived. Or maybe he actually found it hilarious – bloody amateurs! Secondly I recall striking up a conversation, for some unknown reason, with a stranger who had just parked his car in a layby and was setting out for a walk. “Yes, I’m working for the RSPB” I happily told him. I suppose it was a bit odd when he returned quickly to his car and sped off. Back at base I discovered his car number plate on a list of those belonging to known nest-robbers. Later I did get to grips with another dodgy group of characters but I think by that time the peregrines had failed anyway. As a result of my incompetence and obvious lack of knowledge about birds it took another couple of years before I worked for the RSPB again. But this time, in 1981, I suppose it was a really plum job – to spend the summer on Mull and check the island out for breeding white-tailed eagles. A group had wintered there but most were probably too young to start a serious breeding attempt. Once this had been established I turned my attention to the island’s peregrines, and then moved on to survey the whole of Mull for golden eagles. One imagines these wary birds nesting on the most inaccessible precipices but in fact, where there is a high density of them, they will build a nest on any tiny little outcrop or rocky stream side. It was quite an eye-opener! 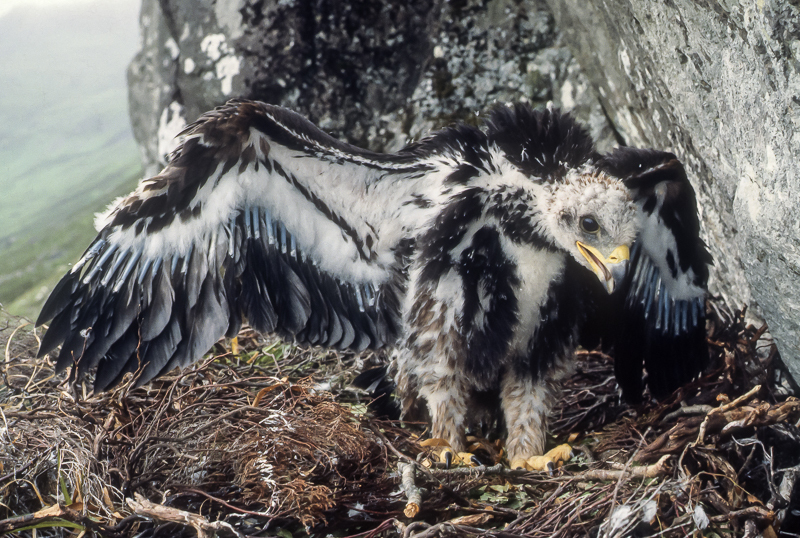 One of the classic texts on golden eagles was written by Seton Gordon during his stay on Mull and he photographed an eyrie there containing three large eaglets. I was able to clamber up to the same ledge where a pair of goldies was rearing just the one youngster in 1981. It was a rather placid creature despite its enormous size. See the picture above. It might sound idyllic but there were many disadvantages. There is always the danger of accidents when one is tramping the hills alone. Scrambling along a crumbling line of inland cliffs I slipped and pulled a large rock down on to my head. Despite bleeding profusely I had to get myself to the local cottage hospital to be stitched up. It was a long walk over rough moorland and then a ten-mile drive to get there. I also managed to upset the local landowner network which did not go down well with RSPB HQ! I had been told by a Forestry Commission worker of a golden eagle pair whose nest had fallen out of an oak tree in a forestry plantation. The adults were rearing the eaglet on the ground and had rebuilt the nest around it. I just had to see this! Well, it was my job……. As I entered the area through tall deer-proof forestry gates I came across a group of people coming the other way. I told them it was illegal to disturb Schedule One bird species at the nest without a licence. A very frosty conversation ensued. When I returned to my digs my landlord (a large landowner) told me that I had actually been on private forestry land. The people I questioned were the landowner and his pals and they were not amused. The island phone lines must have been buzzing that afternoon and from that moment onwards I was persona non grata on most of Mull! The Halstatt lecture is at 1 p.m. on August 26th at MOMA Wales, Machynlleth, Powys. Tickets are £6.00 each. Call 01654 703355 for more details. To follow Tales from Wild Wales, please scroll right to the bottom and click Follow. One can look back on experiences like these with a certain fondness, I suppose. In reality a lot of the time one longed for a normal life with a proper home, friends and stability.